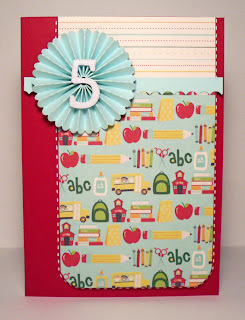 Today I'm sharing some final My Mind's Eye inspiration from my last kit - the School Daze range and the Miss Caroline Howdy Doody range. I loved the main pattern on my first card so I wanted to show a lot of it and make it the main feature. This card also shows off a lot of my favourite design elements - rounded corners, faux stitching and a rosette and not to mention the simple design. For a little bit of effect I put some glossy accents on the apples to create a bit of shine. 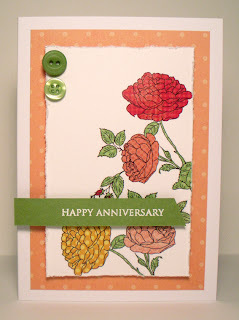 My second card also features one main element and that is the Miss Caroline rub-on flowers. Rub-ons are so quick and easy to use and most come with a tool of some sort to help 'rub-on'. The Miss Caroline Rub-ons include a range of flowers and decorative pieces in a few different styles. I thought the flowers I choose would be just perfect for an anniversary card so I finished the card off with an anniversary sentiment. I hope you all have a wonderful and safe long weekend. Keep an eye out on the blog today for your next ingredient for the long weekend challenge! Supplied used: My Mind's Eye School Daze, My Mind's Eye Miss Caroline Howdy Doody Lovely Mum's Paper, My Mind's Eye Miss Caroline Howdy Doody Happy Rub-on Transfers.